Thunderbird supports different folder view modes. From the standard listing of all folders over a unified folder listing to a listing of all root folders with unread messages. Especially the unread folder view is handy to display only folders with unread messages as it can speed up your workflow significantly. The view mode may on the other hand be insufficient for users who work with lots of folders in Thunderbird. Why? Because the unread folders view mode offers no hierarchical structure. All folders containing unread messages are displayed on their own as root folders in the listing. And that is a problem if you have lots of folders configured in the email client, as it may take longer than it should be to locate a specific folder with unread messages. That, and the fact that you may need to scroll down to see all folders with unread messages. The Thunderbird extension Advanced Unread Folders adds a solution for users of the desktop email client. 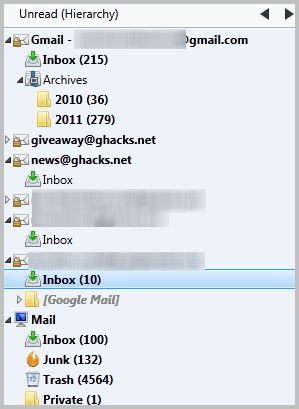 The extension adds a new view mode to Thunderbird that displays unread messages in their folder hierarchy. You can switch folder view modes with a click on the next and previous arrow icons on top of the sidebar. Advanced Unread Folders comes with options to always show specific folders, even if they do not contain unread messages. The inbox, templates and favorite folders are always shown by default. This behavior can be changed in the extension's options. You can disable the default folders from showing up in the unread folder view mode, or add Drafts, Sent and Trash folders to it. Some users may only want to show special folders for certain accounts. 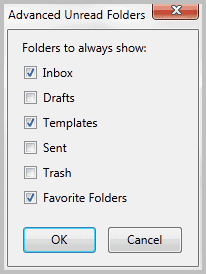 You can do that by adding those folders to the favorites in Thunderbird and enabling favorite folders to the shown "list" in the unread folders view mode. Advanced Unread Folders is especially handy for users with a large folder structure. Users who only work with default folders in Thunderbird do not really need the extension, as the default unread folders view mode handles that scenario well already. The extension is compatible with all Mozilla Thunderbird versions from 3.1 on. It can be downloaded from the official Thunderbird extensions gallery.